The backup module has been a long time member of the available FreePBX modules. It has been well received and has helped many users recover from potential disasters, and for that we are all very grateful. It has also been plagued by various issues and has been one of those modules that many felt could really use an overhaul but at the same time, it’s not the most exciting module that attracts interest from the volunteer development team. Well Tony over at Schmooze Communications has decided that its day has come and volunteered to move it to the top of their priority and get going on a rewrite. So kudos to them for taking the initiative and now it’s your opportunity to help drive the requirements and features to help make sure that this is the last backup module that we need to write, and that it can serve the needs of the varying distributions of FreePBX out there so that there is a common backup ability available amongst FreePBX distributions AND not only can it address the backup needs that might be particular to a distribution, but it can also help users move between FreePBX distributions as their needs (or evaluation process) changes. There are a number of Backup Module feature requests outstanding that I’m sure will make for a good start, but I suspect that there are plenty of other good ideas that are not captured. So please provide feedback, whether opening a new feature requests or just responding to this post which I’m sure Schmooze will keep their eye on. Our next OTTS event is coming up at Digium Headquarters in just over a couple weeks (March 3rd) and there are still a few seats left. 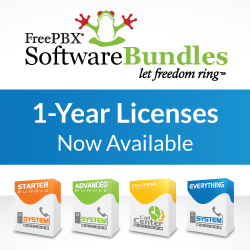 If you are looking for an in depth training in FreePBX along with the other essential telephony and Linux knowledge required to be proficient in this space, this is the place to do it. In addition, learn the much needed sales and marketing knowledge from our successful team who has sold hundreds of systems and can help you learn now to beat the competition while maintaining very strong profit margins. If you would like to join us, register here and use discount code LASTMINUTE to receive one of two $500 discounts that we have just released to fill up the remainder of the class!